Estates at Himbleton were held by Worcester Cathedral Priory throughout the Middle Ages, and a church has existed here since Norman times. It stands at the end of a long lane of timber framed cottages and farms on the north end of the village, though the most attractive approach is by footpath from the lane to Bradley, across a meadow and the Bow Brook. The lias and sandstone church is an unusual shape with a nave, north aisle, south transept, chancel and a large north vestry connected to the aisle by a short passage. The south porch is of timber and at the west end of the have there is a large timber bell turret with a hipped roof. The nave is partly Norman, and the small round arched south doorway has one waterleaf capital indicating a late 12th century date. The chancel is 13th century with an Early English triple lancet east window. The south transept is 14th century with a typical decorated south window, but the transept east window is 16th century. This transept is the Shell Chapel, probably founded as a chantry chapel in the 14th century; but then used by the inhabitants of the hamlet of Shell in the north of the parish, after the separate chapel there passed out of use in the mid 15th century. Many of the remaining windows are late perpendicular with mullions and rounded arches, though the square windows at the west end of the nave and one on the north side of the chancel are probably of about 1600. The south porch is 14th-century, and has bargeboards decorated with quatrefoils. The 15th century bell turret was part faced with shingles and part with half timbering when the western part of the nave was extensively rebuilt in 1893. This was part of a restoration by Ewan Christian with the building work being carried out by Thomas Collins of Tewkesbury. In 1903 the vestry was added by Charles Ford Whitcombe in an Arts and Crafts style, reflected also in his restoration work at nearby Huddington church. The Norman doorway has a 14th century door with panelled quatrefoils, which gives access to the interior with its medieval roofs and plain plastered walls. The north arcade is late Perpendicular with octagonal piers. There is no chancel arch, and the 13th-century chancel is a straightforward extension of the Norman nave. lt was formerly divided by a rood screen and loft, and the blocked rood loft stair doorway can be seen in the north wall of the chancel. The nave and chancel have Perpendicular wagon roofs, with wallplates, which, in the chancel, are carved with battlements, in the nave with foliage and heads. The main font is 12th century and square, with a carved medallion showing a lamb and cross. An 18th century font is in the Shell Chapel, where there is also the remains of a medieval piscina. Most of the fittings date from the 1893 restoration, though the organ of 1910 is by Nicholson, and the communion rail of 1967 by Robert Pamcheri of Bromsgrove. There are traces of wall painting in the Shell Chapel, but most significant are the substantial remains of the royal arms on the east wall of the chancel, possibly those of Elizabeth 1. There is a remarkable survival of medieval glass. 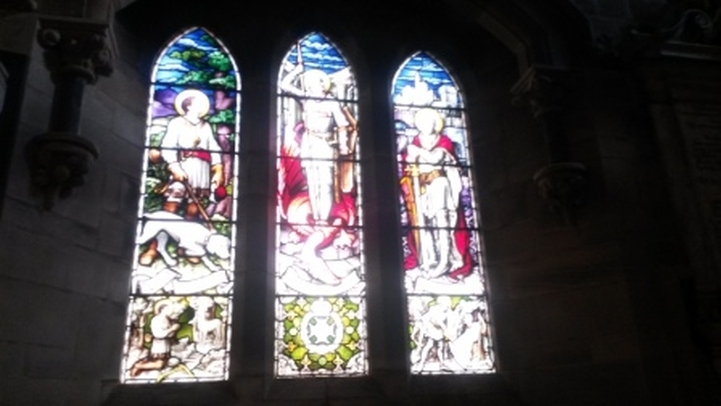 The top right corner of the east window contains a 13th century figure of a female saint, thought to be St. Mary Magdalene, and some quarries painted with leaves. These corroded fragments are possibly the earliest glass in the county, and are now set in a beautiful window, glazed in the late 13th century style by George Ostrehan in 1904. In the previous year Ostrehan also restored the glass in the east window of the Shell Chapel, The glass in the east window which has 15th century fragments showing the Crucifixion, the Virgin and St. John, with donor figures below, who are named in an inscription as Henry and Agnes Goddi. They are otherwise unknown. ln a north chancel window are more 15th century fragments, which include parts of figures of St. Anne and possibly St. Christopher. The initials TH probably refer to the benefactor, Thomas Hartlebury. One of the north aisle windows also contains glass of this date. A figure St. John, now without a head, holds a chalice, and there are parts of St. George and the dragon, St. Catherine, and the arms of the Cokesey and Wintour families (see also the Gunpowder plot page on the Huddington part of the website). At the east of the north aisle the window contains glass by Charles Eamer Kernpe of about 1900 showing the Nativity, and the figures of the two St. Johns on the south side of the chancel are of about 1910 by Christopher Webb. There are several memorial tablets, particularly those in the Shell Chapel to the Fincher family of Shell. The memorial to Philip Fincher, who died in 1755 is by John Laughton of Cleeve Prior. There is an unusual cast iron memorial on the floor to another Philip Fincher, who died in 1660, and his wife Joan. Outside in the churchyard, a large cross marks the grave of Sir Douglas Galton who died in 1899. He was an engineer and keen promoter of public health, who worked towards the establishment of the Red Cross after visiting casualties of the Franco-Prussian War. There is a large sundial on the south wall of the nave, whilst the Lychgate was built in 1931 as a copy of the timber south porch.